Welcome to TeXtalk! Our interviewee is Paulo Cereda. Paulo has collected 24k+ rep, 160+ answers, and 240+ badges on TeX.sx. He is an avid participant in the chat rooms, and a lover of ducks. Paulo is usually our interviewer, but today we’ve turned the tables. I think we’ll start in traditional fashion. Can you tell us a bit about yourself and what first led you to get involved in TeX? Everyone feel free to ask away, and remember these things get edited before going into the blog! Paulo is likely busy writing just now, I’ll give him some air to breathe before hitting him with my questions. Thanks everybody for this nice interview! I’m Brazilian, born and raised in the countryside area of the economic heart of the country, the great São Paulo state. The city where I live is quite small (about 4k people), and it’s a great place. I’ve been working with software development for quite a long time and just recently I’m back to academia for a PhD in computer engineering. Fun times, I’d say. My first contact with TeX and friends was during my Masters, when I had to write a lot of mathematics. Nothing was working (Microsoft Word, I’m looking at you! ), so I was in despair. Suddenly, a friend of mine suggested about this LaTeX thingy he was using for his own thesis, so I decided to give it a try. It was surely love at first sight. How long was the break between your Masters and your PhD? I believe it was something close to 4 years, if I recall correctly. It was interesting because it was a great time for discovery. Sometimes we need to broaden our horizons. How many programming languages do you know? The first language I learned was Pascal (Wirth is truly amazing). It was a lovely experience. Then later came C and C++. Nowadays, I always try to learn something new (at least the basics) language-wise. I know Java (it’s the language I use on a daily basis), PHP, Scala, Ruby, Groovy, a bit of Python, Haskell, Lisp, Clojure, Prolog, Lua and probably a couple more, not to mention the languages I write myself. I love languages. Thanks, but it’s not that impressive. Once you know about algorithms, it’s just a matter of learning a particular syntax. You forgot the most important one. Oh of course, silly me. Oh no! I was joking! Can we presume that TeX is one of your favorite languages? Do many of your colleagues (at university or when you were working in software development) use TeX or are you a lone voice for TeX? Sadly, I think I’m a lone voice for TeX and friends. IMHO Brazil has no strong tradition of TeX in universities (if I had to blame something, I’d point my finger at ABNT, but that’s another story). I know a couple of departments which offer LaTeX templates, but students prefer to stick with Microsoft Office. I usually try to act as a TeX evangelist at times, but my claims go unheard. I think some comments on ABNT would be interesting. Well, maybe at least explain the abbreviation. ABNT should be the Brazilian analog of German DIN or the international ISO. It shares with the other similar organization a deep ignorance of typography. Thanks. Well, let’s mention IEEE, too, it fits in this society it seems. ABNT stands for Brazilian National Standards Organization (acronym in Portuguese, of course: Associação Brasileira de Normas Técnicas). They are responsible for technical standards. Personally I don’t like their standards, and bear in mind that they have so many rules that one university can select which subset to follow and then a certain department can override these subsets by defining their own standards. I love standards, there are lots and lots for you to choose from. It’s a living hell to comply with their rules, and you are hearing this from someone that (to some extent) knows how to write TeX code. May we know your sub field of research/specialization of PhD? I work with adaptive technology (think of something that has self-modification features). A bit of theory of computation and a couple of mathematical models. How did you get the motivation to come back to academia after having worked in the software industry for four years? I’d blame that on being a researcher at heart. Everything happens at the right time, and it’s been a wonderful time since then. If you have tried to popularise TeX in your place, we would be glad to hear the modus operandi you have followed. I usually do everything with TeX (from a conference certificate to a pamphlet). So when people mention to me that the layout is nice, I then reveal it’s TeX-powered. What kind of software do you usually work on? For my work, I have a couple of IDE’s (Eclipse, NetBeans, Idea) and several terminal windows side by side. For TeX, it’s usually vim or TeXworks. Since I use Linux and Mac, I can organize all my things in several workspaces. How did you come in contact with TeX.sx? Thank Donald Arseneau for that. Could you say something about your choice of editor? I always go with vim and TeXworks. Vim is something I learned to love; I was enraged at the beginning, but then I was successfully brainwashed. I like the modal philosophy and since I always had endless fights with my keyboard, reducing my typing range was something desirable. It’s like Marmite, I guess. I have emacs installed in my machines as well and I tried AUCTeX for once. Since it’s Lisp-based, I somehow respect it. But since I look like a heavy vim bloke, I need to fight on the right side. I used to work with producing animated GIFs (oh the shame). Those were the times, I used to draw every single frame with a very bad mouse and almost no skills. I decided to give it a try and I could make some bucks out of it, that’s why I somehow draw things from time to time. [a macaw] and made the bird popular among us (not to mention ducks). What was the motivation to create it? came by accident. I had a nice experience with rubber and liked some things about it (directives, for instance). Then I wrote a very basic code in less than 24 hours and showed a screenshot of it in the TeX.sx chatroom. You guys bought the idea and I decided to convert my attempt into something more serious. Marco Daniel was the culprit for arara growing so fast; he was the true evangelist. Are you fan of Disney’s Ducks as well? Donald is surely a great character, but he’s very angry! And speaking of ducks, is there any (particular) reason you like them so much? How about other birds? I like araras too, and parrots. And hummingbirds. And lots more! I think I once mentioned the duck story in the chatroom, but I’m glad to tell it again! I think the story starts when I tried to learn German. I was very eager to learn it (I was a Rammstein fan at that time), but my time was quite limited: I was in the beginning of my Masters and had lots and lots of things to do, so I had to give up the classes. I decided then to try to study some language by myself, and I opted for sign language. Brazil has its own format called Libras. I think the one I started was ASL (American Sign Language), if I recall correctly. Pardon if I say something very stupid, it’s been a while. I tried to memorize the basic gestures, but I’m a slow learner. In a short period of time, I forgot almost all sentences. Except for a few words. One day, I was in a conference and saw a lone girl in the corner of the auditorium. And I decided to talk to her. When I said hi, she actually didn’t look at me. When I came near her (apparently she didn’t notice my presence), she then looked at me, but said no words. Then she wrote in a piece of paper that she was hearing impaired. So I decided to talk to her through writing sentences in my notebook. At some point, I think I mentioned that I tried to learn ASL, but failed miserably, mostly because I was stupid and could not memorize things. She then asked me to try a sentence for her. I got stuck because, as I said, almost 100% of my sign vocabulary was lost in broken synapses. The only words I could remember were: I (you point your index finger to your chest), love (you cross your arms in front of your chest, just like some pirate flag), you (you point your index finger to the person you want to refer to) and, of course, duck (you close your hand and “quack” twice with it). I thought that if I said I love you, it wouldn’t be interesting. So I went with the second best sentence ever known to mankind: I love ducks. When I did this, she looked at me, very surprised. And then laughed a lot. So I still keep the theme as a good memory of something very tender. I will learn the second best sentence known to mankind in sign language. Behold the power of the duck! My favourite question was Creating a zebra effect using listings, which resulted in yet another great package from Martin Scharrer. Which of your answers on the site is your favourite? I’d say my favourite answer was this one (Can I print only some functions with minted?). It’s quite trivial now that I look at it, but it was the first I actually dealt with coding. Grandma is probably the one that we still harvest points from, but I also like the cute document. You’re the highest ranked voter in the SE world. Can you tell us something about your voting philosophy? I would say voting plays an important role in our community. Because it’s a way of making people feel welcome. My philosophy is, if a question shows effort, it deserves an upvote. For answers, the idea is basically the same. If, by chance, there’s a huge feeling towards downvoting a question, I prefer to leave the question be and try to ask the OP to rephrase things. We can move the world with votes. It’s a good way of making things happen. Everything wins. I vote a lot because I care a lot. I want people to feel the same way I do with this community. We have a lot of fun, it’s a way of brightening your day. We are all part of this and the more people we can get involved, the better. Which musical instruments do you play, which do you own, and which would you like to own? I have a piano and a couple of guitars (accoustic and electric). I’d like to have a bassoon, so I could run after people while carrying an orchestra bazooka. What do you do in your spare time (assuming you have any)? I used to play soccer, but I had several injuries, so I had to quit. Nowadays, I do some bow and arrow and jog a lot. Not to mention that I like to read comics. And which is your favourite piece to play? I’m used to some Brazilian pieces, like the ones from Heitor Villa-Lobos. Also Bossa Nova is a great exercise for pianists, I think everybody should at least give it a try (start with Girl from Ipanema). Thanks for the tip! Do you ever give performances? It’s been a while. I used to have a band, but nowadays I don’t have time for performances. I play in the church, but that’s another kind of repertoire. Indeed it is, but it’s known to be tough, accompanying the congregation. Indeed. You need to think fast. Cool! How often do you play? I almost have no spare time. But at least once a day I play some notes on the piano. And listening to music? But I’m a bit afraid of asking what’s your preferred kind of music. I love classical music, but when I jog, it’s usually Pink Floyd that follows me (You better run! — bad pun, I know). I think it’s good for musicians to have a wide knowledge of songs, including the ones you don’t like too much. Could you say more about the comics you read? Which is your favorite one? I used to read a lot of comics (Marvel in general), but for now I only read those that are available on the web. These are the ones I follow: Awkward Zombie, Dilbert, Dumbing of Age, Garfield, Nerf Now, Foxtrot, XKCD and Questionable Content. Oh and PhD Comics. Hehe… I was about to mention that. 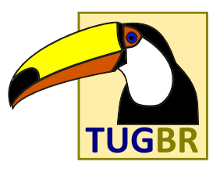 How have you got involved with TUG and UK-TUG? I don’t know. Maybe because Joseph poked me about giving a talk at the 2012 speaker meeting through Skype. And I’m still struggling with getting my subscription. But when I ever get one, it will be from UK-TUG — they have David, so it’s awesome. So you’re not a member of any of these associations? Sadly, not yet. I plan to. I was also thinking of DANTE, but I cannot read German. There’s no Brazilian TUG so far, although I thought of founding one (Karl even gave me some ideas on this subject). I think it wouldn’t be a big group and we would have a lot of headaches because of ABNT. The logotype would be a toucan. Look at this majestic bird! You could have a group of one and be its absolute dictator. Do you make much use of Lua or XeTeX (especially if not writing in English) ? To be honest, I’m still stuck with PDFLaTeX for now, but I’m gradually moving things to XeLaTeX. Once in a while, I write one or two documents which require XeLaTeX, but in general, it’s PDFLaTeX all day and all night. I had some fun with LuaTeX but so far I have been quite pleased with XeLaTeX. The idea of embedding Lua code inside a TeX document is quite interesting, but I’m quite reluctant to mix them. Maybe in the future. Are you planning a visit to Europe, in search for your roots? Yes, it’s in my TODO list. I’d love to visit Italy, specially now that I am officially an Italian citizen. And of course I need to lure you to sign my TeXbook. What do you hate the most about TeX? Can you make a minimal working example? I’ll say something crazy: I actually don’t hate anything about TeX. Perhaps because I love languages, I learned to appreciate the design of them. Knuth knew what he was doing (as always) and the result was awesome. I once wrote my own macro expander and I discovered how tricky it is to provide “mere expansion”. Which books on *TeX are on your bookshelf? I have The TeXbook, The LaTeX Companion, TeX By Topic (I printed one copy) and the L3 interfaces (but thanks to Joseph, my copy is now outdated). Do you like to cook, and what is your favourite dish? I actually don’t know how to cook. Being half Italian, I love my mom’s lasagna. Any current big project? You have to procrastinate writing your PhD thesis, remember! I have arara 4.0 ready, except I still have the manual to write, so the release will be greatly delayed. Let’s see if I can fix that in December. I have plans for a local tree package manager (associated with Martin Scharrer’s CTAN archive), so we will be able to deploy any package version in our local TeX tree for testing purposes. Let’s see if I find time to finish this project. That would be a very nice addition! I blame percusse and his development versions of TikZ. Any more questions? Or should we let Paulo escape? Can I be British too? You’d have to bow to the Queen! Ooh! Or get up every time they play God save the Queen. Wouldn’t “Good morning, ma’am?” suffice? So long as he knew the rules of cricket, it might. Wait hold the press! When do you plan to finish that GUI for biblatex style creation? I want this promise on paper as an evidence for future annoyance. Oh no! Maybe mid-2015? It’s been a complicated year. I’ll do my best and try to achieve something by mid-2015. Thank you for your contributions to TeX and its SX network by the way. I salute you with a 40-duck quack. No, I am the one to thank you guys. We are a team. We only grow as a group. I only work alone mister… Where did I park my DB9? Hi! Thanks for being our interviewee, and thanks to David for that. Hello, thanks for joining the interview! Apart from software are you interested in hardware design and assembly using basic processor chips? I know a couple of things, but to be honest, I never got into hardware design. I think I’m more of a software bloke. But it’s surely nice to have important concepts in mind, even if you don’t work directly in any specific area. One more Q: Why do you love Fedora so much vs. other Linux distros? Any particular reason? I started with Linux in 2000/2001 with a distro based on Red Hat. Later on, I jumped into Slackware and got stuck with it for quite some time. Then I came back to Red Hat until version 9.0, I guess. If I recall correctly, after version 9.0, Red Hat forked their distro into a community driven effort named Fedora Core and a corporative branch named Enterprise Linux. I decided to give FC1 a try and I’m a loyal user since then. I think it’s a natural path, like Debian folks trying out Ubuntu. I believe I’m still a Slackware user at core (my old laptop proudly runs the latest version), but I think Fedora is a great option. As long as people use Linux the right way, I’m happy. Thanks for your time and good chat over TeX.sx. Speaking of your machines, what are their names? And what exactly is the system? The naming convention I have for my machines is cities. I have alexandria (Fedora 20), manchester (Fedora 20), oxford (Mac OSX Yosemite), herakompolis (Mac OSX Lion), and thebes (Slackware 14.1). To break the pattern a little, my development laptop is satyagraha which means insistence on truth. My portable devices are named after cardinal virtues (in Latin): my iPad is temperantia (temperance), my iPod is iustitia (justice), my other tablet is sapientia (prudence) and my cellphone is fortitudo (fortitude). And my router is named potato. At a certain point, life forces you to be organized. In names of your computers? Probably in everything, I guess. Great answers. Where is herakompolis? I think I borrowed the name from a city of the ancient Egypt (I believe the spelling might vary). I once also had a machine named hamunaptra, surprisingly not from Egypt as The mummy movie portrays, but from India. You said you tried to learn some German, some sign language. Are there any plans to learn some basic cooking recipes? To be completely honest, there are plans for me to learn cooking. Once in a while, I grab a notebook and make some notes while my mum is cooking. I even considered preparing a cookbook (in LaTeX, of course). I might come back to this project sometime soon. Also, I want to try German again. German language or German cooking? Both, I guess. I really like German food. How do you manage your voting “strategies”. Do you keep a log of “to do”s handy for when the UTC flips over to 00:00:00 and then let your voting duck bots kick in? , then I’d get usually 30 votes (1 question and 1 answer), which would grant me 10 extra votes. Then these votes keep going to the next 5 items in my list or other answers from the threads I’ve already visited. I guess as the popularity of TeX / LaTeX increases — see this map/graph — there may come a day when you may struggle with the voting decisions. I think I won’t suffer that badly. If a question deserves an answer, it deserves an upvote. That’s admirable, and something that definitely distinguishes this community from others. True, tenacious, unsung heros are non-existent, but ever-present. I think we all do what we can. It’s so lovely to see egreg and David, two TeX demigods, having fun writing competing answers for the sake of helping people to understand TeX and friends. I agree. Major players in this community understand that there is a greater benefit to just answering the question. A little capitalistic competition is benefiting the greater good. Arbitrary question: When did you join this community? January 23, 2011. Two days before egreg joined, if I recall correctly. It’s been a while. Time flies when you don’t know what you’re doing. Exactly. And I haven’t finished reading my TeXbook yet. I’m stuck in some chapter. Afraid to look which one. Thank you for joining, Tom! Thank you guys, you are awesome!